Chinua Achebe's A Man of the People is one of my all-time favorite books. It's a slim novel set in what I assumed to be Nigeria, and it follows an idealistic teacher named Odili who begins as a staunchly incorruptible character right after the end of colonialism. Slowly, he concedes his moral high ground. It's an unflinching observation of human nature, and it is funny. It is the first book I read about Africa that made me laugh. A Man of the People didn't make light of the corruption that helped derail the promise of many West African nations in the wake of the wave of Independence that started with Ghana in 1957; it looked it in the eye. In "Man", before the characters were African, they were human. This seems like an obvious observation, but, perhaps because I grew up hearing Ghana romanticized by my immigrant parents, the story resonated deeply with me -- more so than Achebe's best known novel Things Fall Apart. But as a writer of African heritage, I know it is Things Fall Apart that is globally recognized as the benchmark for the African story. African writing is rarely mentioned apart from Chinua Achebe and this book. For many readers, "Things" is the first and only novel about Africa / by an African that they've read. It is taught in so many universities and high schools; and has been passed from my parents' generation to mine. I and my peers will likely share it with our own children. It is canon. 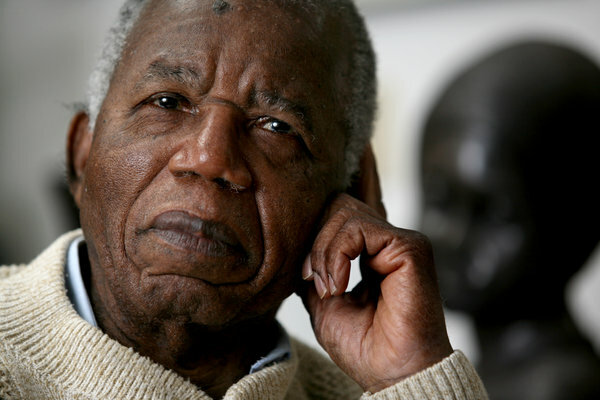 So when I heard Achebe died yesterday, I cried because the man who wrote "Man" and "Things" is gone; and because I felt the weight of a new responsibility to this writing craft. He has done his part and now he rests, leaving it to the next generation to pick up where he left off. Ayesha Harruna Attah (she wrote Commonwealth Writers Prize Finalist Harmattan Rain) and I invite you to join us in discussing our experiences writing about Africa, while living in the Diaspora. African Literature is global. It's African-American, Afro-Latino, Afro-European, Afro-Asian... as much as it is African. Like the "duckoonoo" and greens the Africans that made the Middle Passage found and reinvented in the Americas, Africa's literature has traveled with many of its authors; evolving into new narratives. But, can a literary work borne in the Diaspora claim authentic African identity? Are there specific characteristics that make literature African? We'll be having the conversation at ImageNation's rawspace Gallery, an amazing venue located under the umbrella of the ImageNation Cinema Foundation. The Harlem-based media arts organizaton was founded by Moikgantsi Kgama "with the goal of establishing a chain of art-house cinemas dedicated to progressive media by and about people of color."